When you think of high class, leather is a luxury material that comes to mind. From fine leather gloves, to a leather sofa set, to a fine automobile interior, leather is the substance of extravagance. If you’re looking for a way to add real luxury to your restaurant’s image, then you can’t go wrong with genuine leather. These menus are made of genuine leather and not imitation material. When you purchase these menus, you’re receiving products made of real leather that has been split and tanned from animal hide. The leather itself is stretched over a rigid binder's board and stitched with industrial grade nylon threads. Soft to the touch with a smooth natural grain, these leather menus are further enhanced with an aniline dye coating that adds color, softness, and retains the natural appearance of the leather itself. 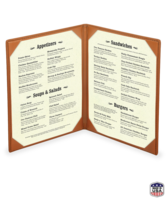 When you use genuine leather menus, you are establishing the brand and image of your restaurant. 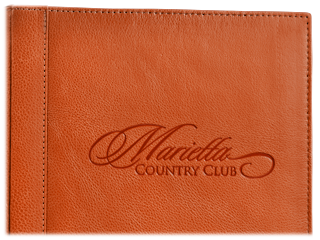 If your business is one that prides itself on presenting guests with an upscale experience, then leather menus are an ideal choice. 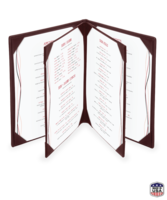 When you buy geniune leather menus covers you are buying a highly durable product. These menu covers will not split or crack due to repeated use, nor will they dog ear or rub thin with age. The scuffing and aging of these menus over time naturally produces the qualities of a fine leather glove: smooth, soft, and timeless. Do not clean these menus with any detergent or soap products. A simple wipe down with a damp cloth is all you need to keep these menus clean. 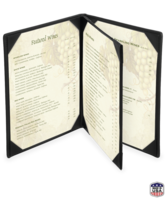 With leather menus, you have a range of sizes and styles to choose from. Styles include single sheet menus, double menus, triple booklets, and quad booklet choices. Size choices are unlimited and include: 5 1/2 in. x 8 1/2 in., 4 1/4 in. x 11 in., 4 1/4 in. x 14 in., 8 1/2 in. x 11 in., 8 1/2 in. x 14 in., and 11 in. x 17 in. These menus come in a wide range of colors with 30 choices available. Colors range from from bright to earthtone and everything inbetween. There is nothing quite as classy as real leather. 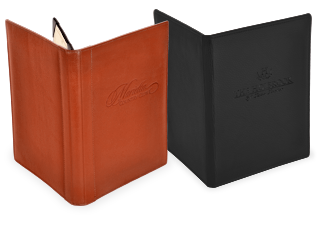 When you choose leather menus for your restaurant, you are getting one of the highest quality materials on the market. 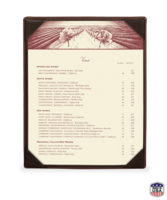 These menus are long lasting and add a touch of luxury and class to your establishment. 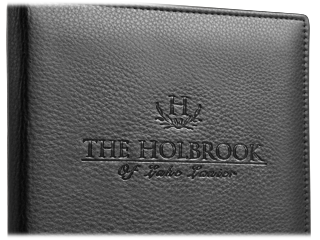 The highest standard in quality, the genuine leather menu covers offer the highest tier or quality and luxury for a restaurants brand.